T66553A: 08-16 Toyota Sequoia Bolt Over Billet Grille with Logo Opening. Give your Sequoia an instant upgrade with this polished billet grille. 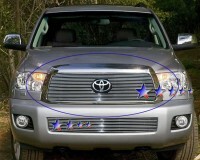 Easily installs as a bolt-on grille and comes with an opening for the Toyota logo to show through. Installation time is about 15mins. Comes with hardware and installation instructions. Matching bumper billet grille is also available above as an additional item. Backed by manufacturers one year warranty. Imported. Tell your friends about the Billet Grille Bolt-Over (w/Logo Opening). Share this product on Facebook, Twitter, MySpace or send an email to a friend!